If we are Twitter pals, you may recall that a couple weeks ago I tweeted a smattering of frantic SOS-like questions pertaining to the exact whereabouts of a particular lemon and blueberry loaf that I was so sure I had seen and read, then forgotten, then remembered, and ultimately misplaced. I still haven’t found it. It is somewhere, out in the blog-osphere, taunting me. One day I will find it. The reason for the panic was that I had been talking food (what else?) with my dear friend, Janna, who is a real delight and understands that all cannot be right with the world when one is on the hunt for a recipe. See, I had promised to forward it to her, but then I’d forgotten where I had seen it, and I was trying to appear organized, resourceful and master of my baking domain. Instead, I failed and flailed, but being the excellent friend that she is, Janna sent me a recipe instead. Her mother’s cinnamon loaf recipe, to be exact. I read it through. It seemed simple enough. It called for soured milk (nothing a spritz of lemon wouldn’t solve) but I happened to have buttermilk. The cinnamon and brown sugar promised an intoxicating aroma, and as Janna put it, “Your whole house will smell sweet. It just takes over!”. Sold. 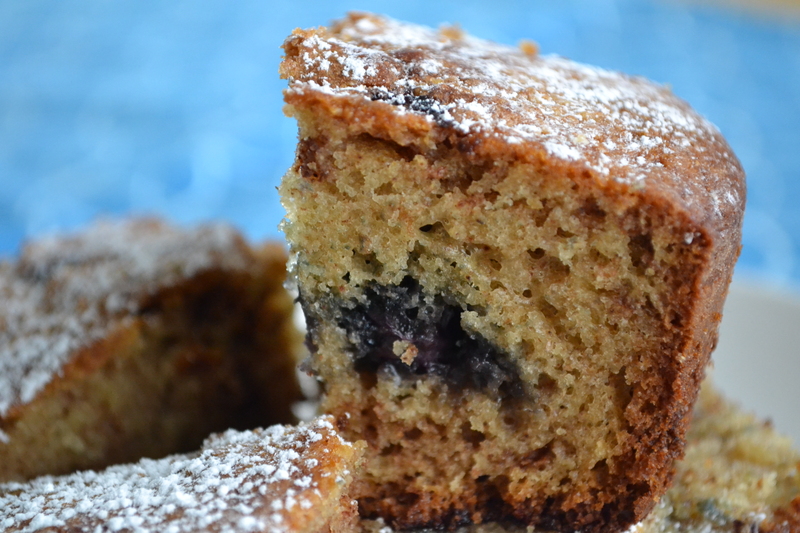 But there I was, still with the lemon blueberry loaf on my mind, and then it hit me … blueberries and cinnamon. Oh yes. Oh. Yes. So I whipped up the batter (shockingly runny!) and layered it with the cinnamon sugar, then deftly thwacked the heavy, dark berries into the surface. Into the oven it went. As if by magic, or the delicious psychic-ism of old friends, the phone rang. Who else but Janna? An hour later, the phone call over, the cake emerged, golden, spiced and berries bubbling. 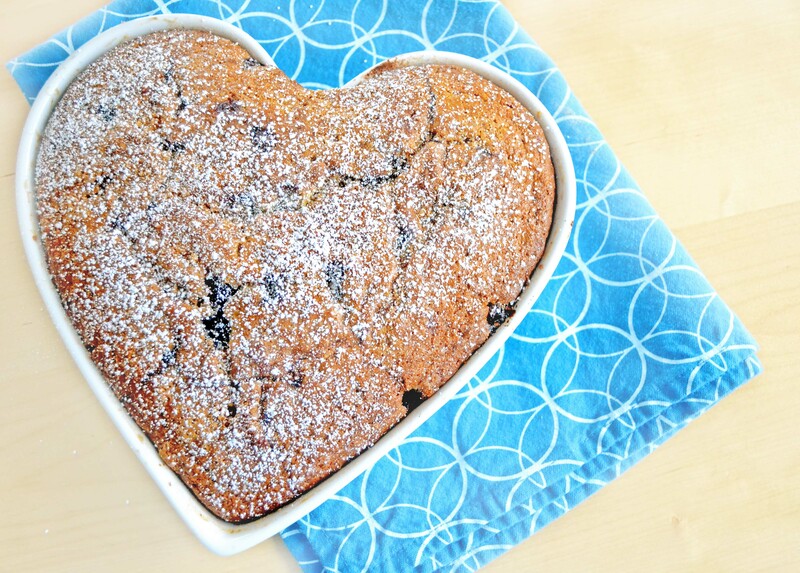 I was glad I had baked it in a heart shaped dish — it made me smile. Cooled and cut, dusted with powdered sugar, it was fantastic; simple and homey. It was a far cry from lemon but somehow, thanks to the thoughtfulness of a friend and a dependable recipe, all was right with the world. Grease and flour a standard loaf pan or 8×8 square pan, set aside. Mix the brown sugar and cinnamon together in a small bowl, set aside. In a large mixing bowl, cream together the butter and sugar. Add the vanilla, mix well. Add the eggs, one at a time, mixing well between additions. Beat until pale, fluffy and well incorporated. Pour approximately one 3rd of the dry mixture into the wet mixture, incorporate swiftly without over mixing. Add 1/2 the buttermilk, again, incorporating swiftly. Repeat, alternating with the remaining 2/3 of the dry ingredients and the second 1/2 of the buttermilk. The batter will be quite wet, similar to pancake batter. Pour a thin layer of the batter into the prepared pan, sprinkle over some of cinnamon sugar mixture. Alternate, making layers until both the batter and the cinnamon sugar are used. Swirl the layers with a knife, chopstick, skewer, etc. Drop the blueberries, in a single layer all over the surface. Push some of them down into the batter and let others remain on top. Bake for 1 hour – 1 hour 15 mins. The cake will be done when a toothpick or skewer inserted in its center comes out clean. Allow to cool 10 minutes in the pan on a wire rack, then turn the cake out to cool completely. Once cool, sprinkle with powdered sugar.